for each new patient who comes to our clinic on your recommendation. There is no limit to the number of gift cards you can receive! Cannot be redeemed for cash or applied to professional fees. 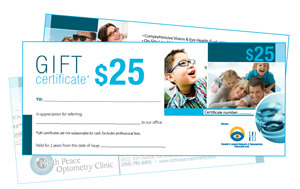 Thank you for your trust in our eyecare!